Home > Free > New Dove & Kellogg’s Instant Win Games! New Dove & Kellogg’s Instant Win Games! Normally I don’t share a lot of sweepstakes, but there are two food related ones that you might want to try out. One for chocolate (yum) and one on specially marked Kellogg’s products that we’ll all probably be buying anyway. Get all the details below and let’s win 2 really fun things: chocolate ice cream & money! 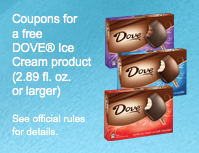 When your afternoon chocolate cravings hit (please tell me that it’s not just me) try your hand at winning a free Dove Ice Cream in their new Instant Win Game! Keep an eye out for specially marked packages of Kellogg’s cereal that may contain up to a $100 cash card! Even if you win one of the smaller prizes it will more than pay for your B1G1 cereal!